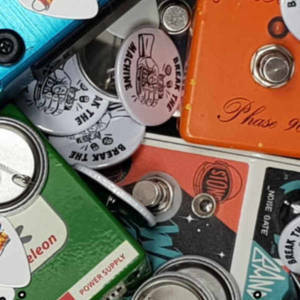 For the first in a series of Machine Bites Blog posts, John Tron Davidson, musician, writer, music journalist, radio presenter and guitar pick connoisseur, takes us on a journey through his signal chain, his do’s and do nots and chucks in a mantra at the end, just for the hell of it…. Pedals are cool aren’t they? Yes is the obvious answer here – it’s even implied in the way I asked the question. Guitarists especially get terribly excited about these things. I’ve always loved pedals, that feel of stamping my foot down and changing my sound fundamentally. Naturally, the loud ones are always the funnest, with a big healthy overdrive being my personal favourite. Something about the clarity of the racket I’m making gives me a tremendous feeling of grandeur, which is a big part of the music I make. As a result, I’ve banged through a lot of drives over the years, from my very first Danelectro Daddy-O through the original Marshall Drivemaster, to the Option 5 Destination Overdrive and Oddfellow Caveman,and now my custom Goldsoundz Leopold, so I’ve learned a couple of important things along the way. Number one: unless you’re pushing into noise territory (where anything goes), however much gain you think you need, it’s less. Excessive gain makes your chords mushy, and anyone who’s ever run a RAT at full beans will tell you that all that hair results in a sudden thinness. Number two – compression. I run an MXR Mini Dyna Comp before my Leopold and never turn it off. This makes my cleans enormous, makes my pick attack mean more, allows me to back off my volume control more effectively so I can leave my drive on all the time, and adds saturation to my signal without mangling the chord definition. I was a true luddite in regards to this much-misunderstood effect for years, so I guess I’m just growing up. Number four. There’s no real rules. How you lay your pedal board out is entirely up to you. Wah at the end? Fine. Reverb before the drive? Hail the cloud! Delay into another delay into another delay with the middle one running backwards? Why not? Who told you you can’t? There’s only ever a broad suggestion – no-one is going to ban you from using effects for putting them in the wrong order. Number five, and the most important. If you run a proper Star Trek set-up with everything under the sun on it, that’s cool. If what you really need is a tuner and a BF-2, don’t be ashamed to strip it back. If your sound necessitates pedals, it’s unlikely you’ll ever *not* use them – you’ll always buy something because it’s bright orange or has a funny name. Taking a real, genuine interest in the bits you truly require means building a collection of pedals that lets you achieve what you want to, not to mention broadening both your enjoyment and your playing. If you sound the way you want to, it’ll make you play more. Hooray! Remember, your pedal chain is as individual as you are. Even if someone runs exactly the same units, they won’t run them exactly the same way, and crucially, they aren’t you! Experiment, live free, and tone hard. John Tron Davidson is a musician, writer, music journalist and radio presenter. Currently playing for The Lifted Chalice and presenting The Way Of Things on Phonic FM, years of musical instrument retail (including 4 1/2 years on Denmark Street) have left him with an addiction to fancy plectrums and loud effects. Experiment, live free, and tone hard…indeed! I’m in! I’m In Tune!